Flossing once a day can help you maintain exceptional oral health and reduce gum bleeding. The area between your teeth is most susceptible to plaque buildup, so it’s vital to floss so you’re able to get those hard-to-reach places. It can also reduce your bad breath and prevent gum disease. Be mindful that there is such thing as over flossing, which can cause serious harm to your gum tissue, so just once a day should be enough to keep your mouth healthy. The purpose of flossing is to dislodge food debris trapped between your teeth. Dental floss is the perfect tool to do this. All you need to do is rip a piece off, wrap it around each of your middle fingers, and slide it up and down between your teeth to pick up particles. Traditional dental floss is convenient to carry and take with you wherever you go. You won’t have to worry about lugging a battery-powered machine around on your trips. It also has positive benefits for your overall oral health by helping keep problems like gum disease and bacteria buildup at bay. Water flossing includes using a hand-held gadget that steadily streams water and can be used to target food debris between your teeth. This can be an easier way to floss for people who have difficulty holding regular floss taut, who have braces, or who have had dental work done. It’s significantly easier to use than regular dental floss because it requires less pressure and joint movement on your hands and is easier to maneuver. Water flossers were first introduced in 1962 and numerous studies have been done to test their effectiveness since then. Over 20 clinical trials have confirmed that water flossing helps to reduce bleeding and gingivitis. It’s been found to be incredibly helpful when cleaning around dental implants and other restorations as well, making them last longer. Keeping up with cleaning your braces has been another hassle that water flossing has helped simplify. Because you are able to target certain spots of your mouth without having to worry about finagling dental floss through all that metal, studies have shown that people who use this method showed 3 times the plaque reduction when compared to using traditional floss. 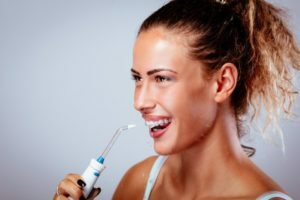 Depending on your price range and how comfortable you are with using regular floss, your personal preference is ultimately what matters when it comes to shaking up your oral hygiene routine. Speaking to your dentist about any concerns or suggestions they may have is a good step to take to help solidify your decision. There’s one thing everybody can agree on though: your teeth and gums are vital to your overall health. If you feel you’re not getting the results that you want from traditional flossing, water flossing might be the option for you! Dr. Krista Cayo has been serving her community’s dental needs for over 6 years. She’s passionate about helping her patients maintain bright smiles and exceptional oral health by giving them the tools they need to practice the best preventive care at home. For any questions or to schedule an appointment, visit her website or contact Cayo Dental Care at 636-928-9693.